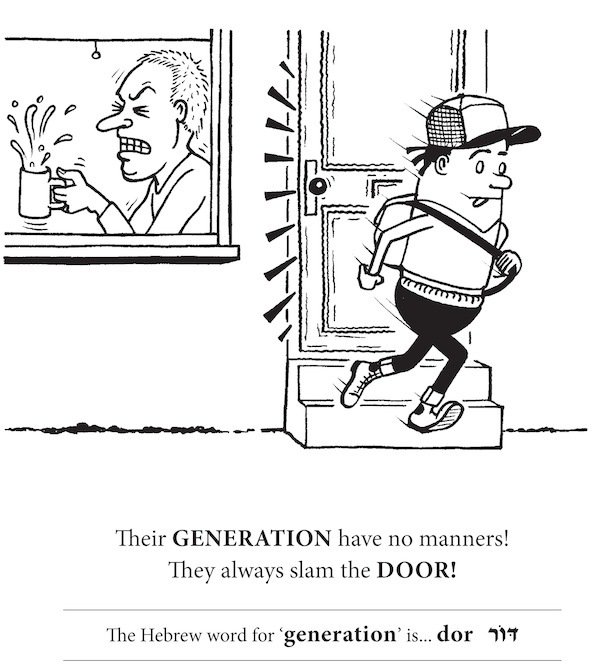 Through such silly sentences, readers of Hilarious Hebrew: The Fun and Fast Way to Learn the Language (Pitango Publishing) learn that, in Hebrew, the word for monkey is kof (pronounced similarly to cough) and that imagination is dim’yon (pronounced dim, yawn). If the context of the sentences isn’t enough, the illustrations should ensure you remember. “The method in Hilarious Hebrew is aimed at teaching vocabulary rather than whole sentences because the whole point of it is to teach a Hebrew word in the context of a sentence in English that would convey the pronunciation and the meaning of the new word (in Hebrew) through a familiar, easy context (in English),” explained Hebrew teacher Yael Breuer, who co-authored the book with musician Eyal Shavit. The writing duo is continually coming up with new teaching phrases, which they often post on the book’s Facebook page, Instagram and Twitter accounts, said Breuer. And her testing ground has been extensive. The longtime teacher has worked with a wide variety of students: “people with family members in Israel, people who planned to visit Israel, partners of Israelis who want to learn some Hebrew, people converting to Judaism, a vicar, nuns – a real interesting mix,” she said. About the book’s origins, Breuer said she shared a list of 20 to 30 sentences that she used regularly in teaching with Shavit, who is also an Israeli expat living in Brighton, England. “Eyal loved the idea so much and started making up new sentences and texting them to me to make me laugh. I started reciprocating with new sentences that I would make up and, for awhile, we were just making up sentences for our own amusement. A few months down the line, however, when I realized that there were about 300 sentences that taught a variety of Hebrew words from various fields and at all levels, I suggested to Eyal that we share the resource – and that’s how the idea of the book came about. An important part of the book’s appeal is the drawings by cartoonist, writer and illustrator Aubrey Smith, who has contributed his art to several books and also has written How to Build a Robot with Your Dad and Screw It, both published by Michael O’Mara Books. 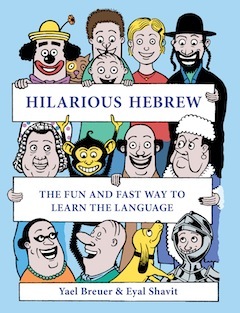 Hilarious Hebrew is available at hilarioushebrew.com, some bookshops and gift stores and also on Amazon.